From October 29th to 31st, King Willem Alexander and Queen Maxima from the Netherlands paid a state visit to Japan. 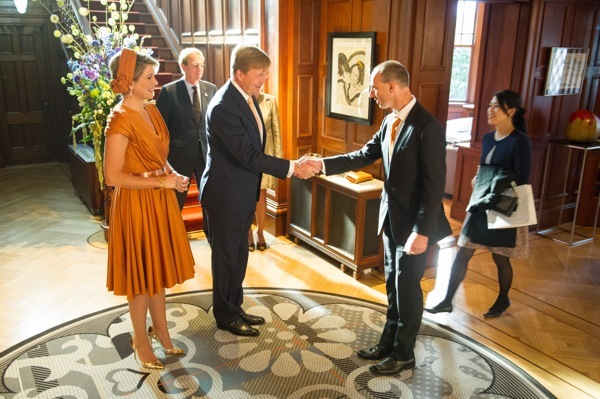 Since Willem Alexander ascended the throne in April 2013, this was only the second state visit by the royal couple and Japan even had the honour to be the first country outside of Europe that they visited! Even though the king and queen had a tight schedule during their three-day visit, they still had time to meet Dutch citizens living in Japan. Only 200 people could attend the meeting. My wife and I were two of the lucky ones. Out of these 200, I was even selected to really have a “chat” with the king. As there was not enough time for the king and queen to talk to each of the visitors, only 64 people were selected. The meeting was held at the residence of the Dutch ambassador. After their arrival, the king and queen took place in one of the rooms of the ambassador's residence. All the visitors were lined up, waiting to shake hands and greet the king and queen. On entering the room, each person was introduced to the king and queen personally. After our names were announced to the royal couple, my wife and I entered the room. There they were standing. They looked so dignified. Both the king and queen are tall. The king must be about 190 cm and the queen, wearing high heels, was only a little shorter. We greeted the king and queen and shook hands. There was no time at that moment to talk, so we had to move on immediately. On the way out we passed the ambassador and the Dutch Minister of Foreign Affairs and we also greeted them and shook hands. Although I had never met the ambassador before, he instantly knew that I was one of the 64 people with whom the king would talk when I introduced myself to him! After greeting the king and queen, all visitors gathered in the garden of the residence. There the king and queen mingled with the guests. The guests who were selected to talk to the king and queen were divided into eight tables. For each table, eight minutes were allotted as visiting time for the king and queen. Everything was worked out precisely. Even so, the king stayed a few minutes longer. He talked very casually with us about his visit to Japan and he inquired how it is as Dutch people to live in Japan. It was great to see how our monarch showed interest in his subjects. I was happy I could attend this meeting. It definitely was a special experience. We at Ecole Hibari would like to congratulate all the children for passing their Eiken Levels 4 and 5 examinations. Your teachers are so proud of you. Continue doing your best in your classes!